Isn't it amazing? 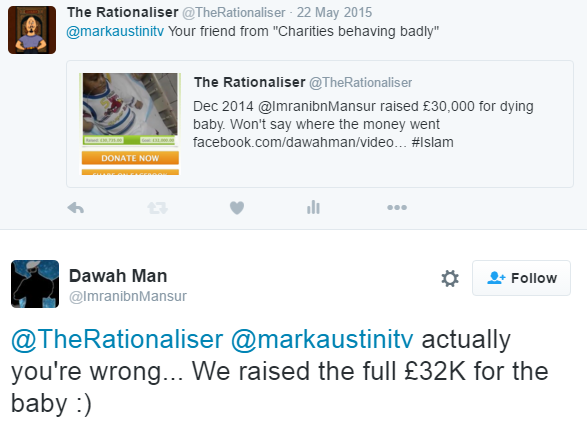 For a year I and others have been requesting information about the health of the baby Imran raised money for and there has been no response. I gathered the evidence from his Facebook pages etc and put it into a blog and within hours he has posted an update. The first thing I want to say is that I am very pleased to see the baby is okay, his foot operation has gone well and it seems he is now fit enough to travel for surgery. This is excellent news! 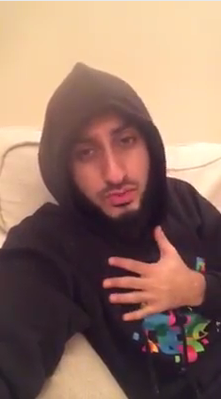 I do feel, however, that I should address the facebook post Imran made when he released the new video footage. Evidently he is annoyed that I have been so persistent in requesting information for an update. I don't think there is anything wrong with asking for a status update on a baby who "is going to die" and for whom "time is running out", especially when time was running out over a year ago and money has been raised to save his life. 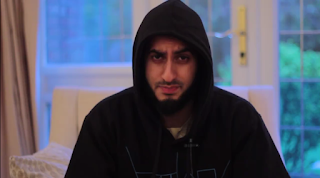 It seems though that Dawah Man is pissed off about having to tell people what he has done with their £32,000 and made a bit of a hissy fit attack against my character, which I now intend to address. Who is the atheist who made this accusation against me? First thought, can't I just be a person? There is obviously some kind of mental link here...man do bad thing, man is atheist, atheists bad. My lack of belief in the supernatural is irrelevant, if I had been a Christian or a Muslim, and if Imran had been an atheist I would still have repeatedly asked him for updates on the dying baby. My second thought: What accusation? No, seriously, what have I accused anyone of? All my post did was to collect posts by Imran (Dawah Man) and lay them out in chronological order. You see, here is the problem, Imran seems to think that someone asking someone who raised £32,000 for charity for an update report is an accusation of theft. The individual who made this accusation against me is an Islamaphobic person who has dedicated his life in trying to bring down Islam. His whole life has been dedicated to this cause. I'm sorry for laughing, but really, that was very funny. Firstly I note I am again referred to as "the individual", I am starting to feel a bit like Lord Voldemort, he who should not be named. What's this about me Islamaphobic [sic]. A simple attempt at making me look like an unreasonable and illogical person who acts on emotion (hate probably), when that is nothing like me at all. I create videos about Islam and write the odd blog because once (when I was an agnostic theist) I looked into the subject with the hope of discovering it was true. I found there was a lot of bias & disinformation out there about Islam (from both the Muslim and Christian side) and so I thought others might find the views of a religiously neutral party interesting. I didn't even read the Quran until I was in my mid 30's, so to claim I have been trying to bring down Islam my whole life is laughable. I am anti-Islam, but only as much as a Muslim is anti-pagan or anti-atheist....in fact, from my experiences I would say to a much lesser degree than that. I care about the truth, circumstances led me to learn about Islam, it took a long time because I had to fight my way through the misinformation, and by the end I just felt that amount of time spent would be a waste if I didn't put forward my own conclusions. Not only that, but he is known for attacking brothers in the da'wah and trying to put things on them that they are free from. A few months ago he put out an article about a brother who does da'wah saying that he was found on some website where men and women go to cheat on their spouses. Later it was found out that the brother in question was free from this accusation and had been a victim of identity fraud which looked like it was done for the purpose of trying to character assassinate him. Now, this was the part that made me want to write this response. 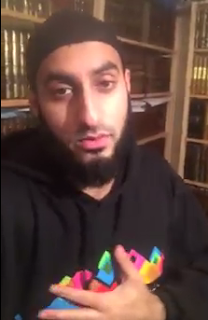 Imran here is talking about Hamza Andreas Tzortzis and the Ashley Madison incident. I did indeed discover Andreas's information in the hacked database release, but what did I do about it? Did I make a video, write a blog, accuse him of adultery? No! I emailed him my mobile phone number to tell him this information is out in the open. He phoned me and we discussed it privately. I had just started a 4 day holiday when Andreas got back in touch with me and asked me to check something for him in the DB. One thing led to another and about 2 or 3 days later we had finished going through the database to try to build up a complete picture so that Andreas could establish exactly what was and was not in there. The point is, not only did I not do any kind of character assassination on Andreas, I spent the best part of a short family holiday doing what I would consider work (I work in IT) free of charge. Andreas wrote to thank me for all the help I had given him. Andreas made a statement on Facebook letting people know his details were in the hack, and then the press picked up on it. I remained silent. 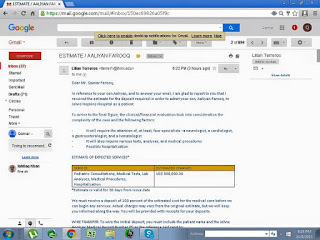 At some point the "anti-Hamza" group had started to make false claims about what the data did or did not suggest. One newspaper (I don't recall which) made claims that I knew were untrue having looked at the data myself, but they refused to correct the article. So, with Andreas's blessing I wrote an article myself. I told him in advance (many times in private) that I thought the evidence made a more compelling case for guilt than innocence, but he was happy for me to write the blog because I was setting the facts straight. As a consequence the on-line story with the misinformation in it was altered and the fictitious "smoking gun" was removed. "Islam teaches us fairness. In no way can the Rationaliser be accused for anything concerning my ID fraud, he actually helped me a lot with access to the data and by interpreting it." I hope this puts to rest Imran's attempted character assassination? He has now released this article about myself, when I had already been in touch with him and told him that I will put the information online as I have more updates. Yes he did, as you saw in the article I posted, but nothing for months, and after 15 months I think it is reasonable for me to decide to stop nagging him for an update on the baby and instead detail the event in a blog and leave it. I didn't want to keep asking him, but I also didn't just want the question to remain unanswered. My blog was intended to give out the information simply as a list of facts so that others can ask him for updates instead, I'd had enough. It is also worth mentioning that he got in touch with the fraud department at the Metropolitan Police, asking them to investigate this matter further. They got back to him telling him that I am in the clear, yet he is still insisting on pushing this narrative. I can forgive Imran for this error as I doubt he is in possession of the full facts. 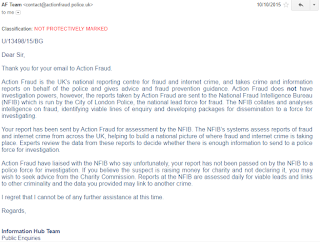 I actually contacted Action Fraud, which is a national office run by the police. These people do not have any investigative powers at all, they simply look at the facts and then they decide if the issue looks suspicious enough to be passed on. I provided Action Fraud with the same information I wrote in my blog about Imran, and it was they who decided it looked suspicious and should be passed on to the National Fraud Intelligence Bureau, and so they did. 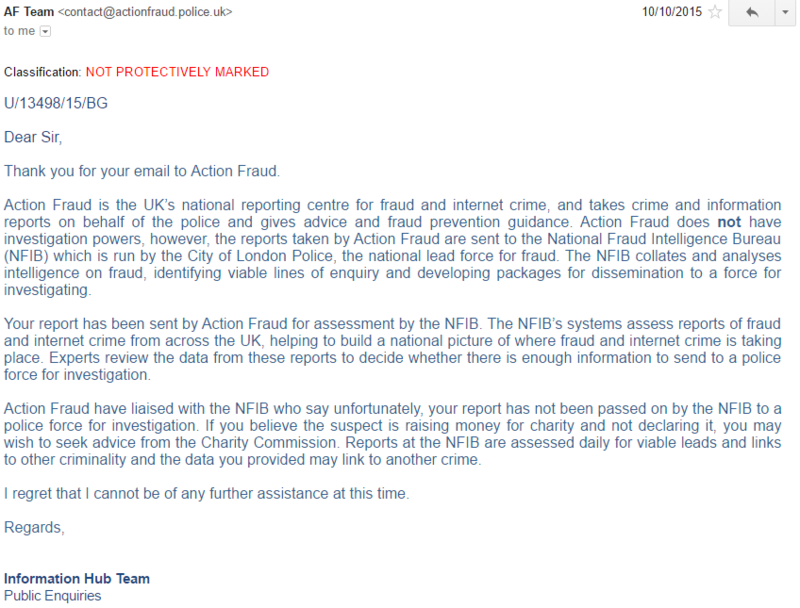 Now, the NFIB have some kind of investigative powers, what they do exactly I do not know, but it is the NFIB who are responsible for deciding whether or not the police should be involved, and this is the email I received from them. 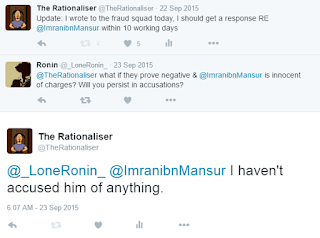 As you can see, nobody got back to me to tell me Imran was "in the clear" - but I wouldn't expect Imran to know that. 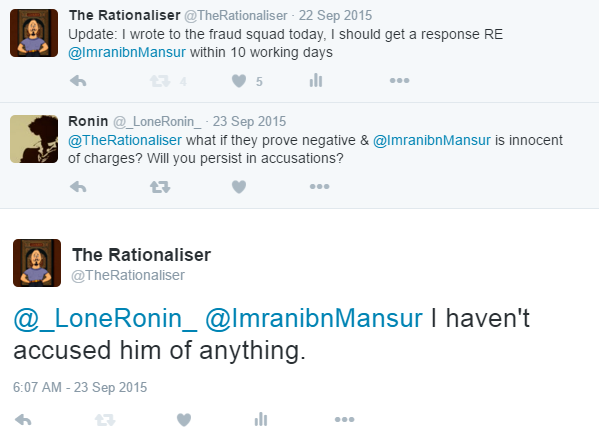 Not only did I not know if Imran was "in the clear" or not, but I wasn't even told if any investigation had been done, and I still don't know if they even went out and interviewed him. For all I know he is only aware of me reporting him because I told him about it on Twitter. I reported it to an agency that decides if it should be reported to the police's fraud department. Based on the information I provided it was they who decided it should be looked at. They passed it on to the FNIB. FNIB told me they were not going to pass it on to the police for investigation. Does that mean I wrote this blog knowing he had been "given the all clear"? Clearly not! Don't you think that if someone REALLY scammed people for £32,000… online!!! When he is a PUBLIC FIGURE like myself… don't you think this person would already have been behind bars? Second thought: £32,000 is nothing compared to scams that religious people have pulled off in the past, and continue to pull off today. Nobody should ever be beyond suspicion. You were given the benefit of the doubt for 10 months before your constant refusal to comment on the matter made me feel like I had no choice other than to let an independent party investigate. Remember, Imran, when you collect £32,000 of people's money for charity you have a duty to keep these people updated. Saying you've recorded a video, it's in editing, and will be out next week and then neither releasing it or commenting on the situation for months is not good practice, and it certainly isn't the kind of behaviour donors expect from someone who raises money on a regular basis. It is not only myself and other atheists who have said so either. I have seen Muslims making comments such as "I am sure he hasn't stolen the money, but he really should have told us by now what is going on". I have even spoken to a Muslim who claims to have asked you about it only to be told you'd be bringing out a video ("Next week" I think he said). Another video that didn't materialise. Keep in mind that during this whole year I have not once said that I think you have stolen the money, when people have asserted that I have merely replied that I do not know what you have done with it and that I am interested in receiving an update about the dying baby. That is what I repeated in my blog of yesterday too. Please don't present yourself as some kind of victim in all of this just to try to hide the fact that you neglected your donors and/or was incompetent with handling the whole thing. 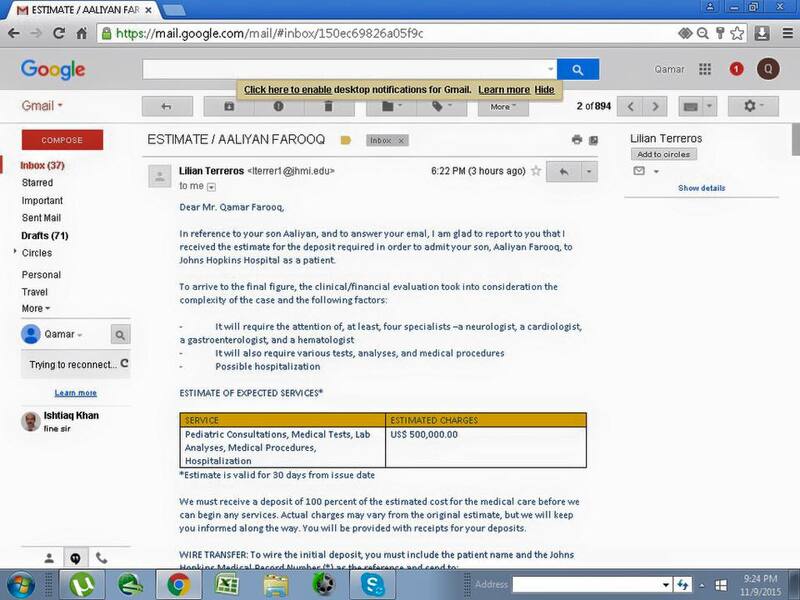 The correspondence email from the US hospital that you showed in your Facebook post was received by you on September 11th, 2015, which means you went a whole six months before bothering to tell us. Obviously I won't ask you to make a video apologising for your illegitimate attempt at assassinating my character, I don't think I have the patience to wait until "next week" for it to be edited and uploaded. I would like to finish by saying that despite the US putting up the price of the operation to $500,000 due to the baby having a more serious condition than they thought, I was pleased to hear in your update video that you were able to find a hospital in Europe that was willing to do the more complicated treatment at a cost matching exactly how much you've already raised. 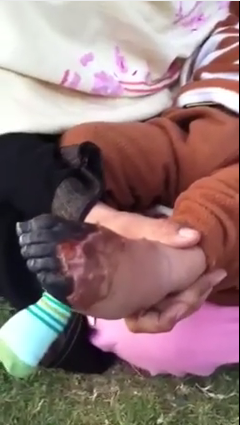 Here is a screenshot from a video by Imran Khan a.k.a. "DawahMan". It was posted on Facebook on November 17th, 2014. Today I'm asking you guys to be generous, but with a cause that's more closer to home. From my mother's side of the family in Pakistan I have a relative whose younger child is only two years old is suffering from respiratory distress syndrome. I'm not a doctor so I don't want to go too much into the science of how it works, you can check it all out online, but basically what it means is that the oxygen isn't travelling around his body and he's...[pause]...gonna die. On November 25th, 2014 he posted another video, again asking for more money. I've been fund raising for this young baby in my extended family, he's two years old and his name is Ali, and he's suffering from a lung problem...and he's actually...the doctors told him he won't survive unless he has a treatment done. 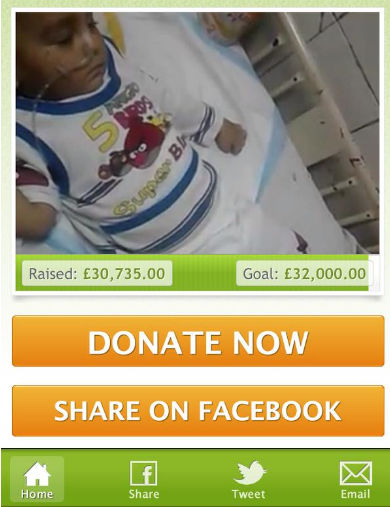 Thank you guys for all the money that has been raised for baby Adian...We have reached basically practically just under £20,000. Just a little bit more to go before we can get the full money to get his treatment over in the USA. I mean, he is in critical condition. Without the machines he is rigged up to he would die. Time is running out. On December 12th, 2014 another video appeared on Facebook. Two of the veins in my child's brain have been damaged, he has a heart problem, he has a clot in the left [unknown] and now his chest is raising. His feet also have a [unknown] problem. Over here, in Pakistan, the doctors have given their answer, that his treatment is not possible here. I appeal that you give whatever help you can for my child's life. We'll try whatever's possible. There's also a saying in the hadith that whoever saves a life it is as though they've saved the whole of mankind. The last screen shot I was able to capture of the fund raiser was at £30,000 just before Imran created a video (that I now cannot find) claiming the baby had to have his foot amputated and was too ill to travel to the US for his life critical life saving treatment he needs otherwise he will die. May 9th: Update "next week"
Since then Dawah Man has outright ignored the question. It's now the end of March 2016; 15 months after he finished raising the money, and 10 months after the promised update that was due "next week". Since then Imran has uploaded over 50 videos to his Facebook page. Is the baby alive? Does he have the medical equipment his parents needed to buy to keep him alive? Has he been flown to the US for treatment? Are you ever going to release accounts showing where the money went? I'd like to do a short experiment regarding human memory. I'm looking for a handful of people who will be willing to watch a short video of some event I have yet to choose (nothing disturbing) and then answer a question or two about it whilst I record both the question and the answer. I'd then like to get back in touch about a month later to requestion you, the second interview will also be recorded. You'll need to make yourself available via an Internet video chat for 5 to 10 minutes on two occasions, approximately one month apart. You'll be free to change your mind at any point and no longer participate, in which case any footage of you I have will be deleted and not used. You'll be shown the production before it is released and have the right to have your contribution removed. To prevent a copyright claim on the final video, if you agree to your footage being used in the final video after previewing it then you waive the right to request your footage to be unused or for the final production to be removed. Your face will be visible in the video. To register your interest please email TheRationaliser at gmail.com with the subject "Experiment". You may recall members of the online atheist community (Captain Disguise, Stop1Spamming, PZ Myers and myself) set about ridiculing the iERA's claims that the Quran contained "Scientific Miracles", accurate information that pre-dates scientific discovery by over a millennia. Finally it seems that iERA saw the error of their ways and decided to drop that narrative. Of course, the narrative wasn't dropped until they could think up a way of being right after all; in summary the approach is "Science is good when the Quran matches its rules, otherwise it is useful but wrong". I am pleased iERA were embarrassed by this claim, it's outright silly and clearly no effort had been put into researching the truth of premise 1, let alone having any evidence for premise 2. I had hoped they'd just go back to telling gullible members of the public that the Quran is a linguistic miracle they could see if only they could understand Arabic, and for now they should take the word of the Da'ee (who probably doesn't understand Arabic). On February 26th 2016 iERA hosted a Don't Hate Debate event "Does Islam need a reformation?" which I blogged about here. Whilst hanging around waiting for the event to start I was offered a copy of the following booklet, which I finally had a quick peek inside this morning. So, what do we see here? First the old expanding universe claim. 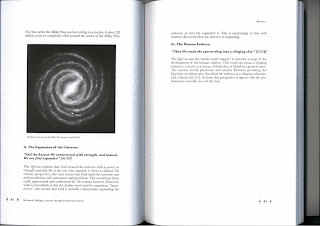 It claims " lamusi'una also means that God is actually continuously expanding it." Of course this is rubbish, the word in question is not a verb so cannot be something ongoing nor something completed, it is a noun. Your mother gave birth to you, that's a past tense verb; but she will forever remain "your giver of birth" even though then act is now over with. This verse says nothing more than "Allah is the expander of the universe", without saying whether it is expanding, or expanded. 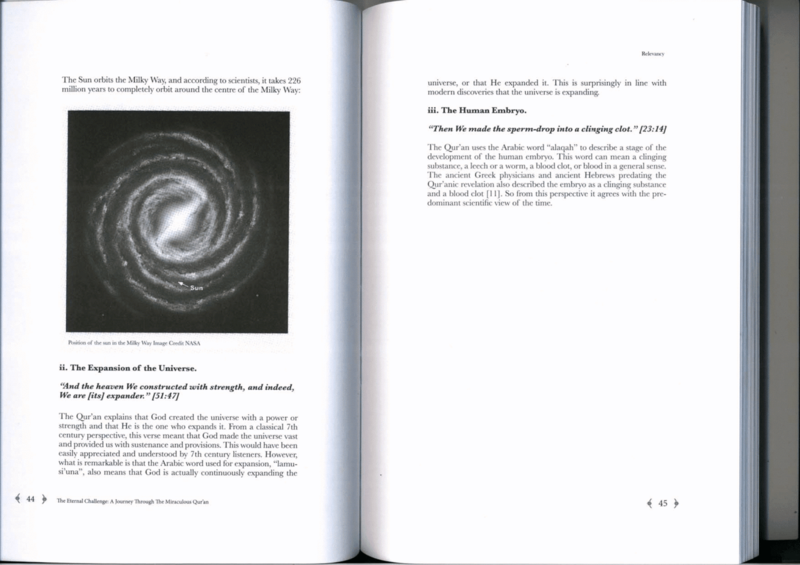 The book concludes "This is surprisingly in line with modern discoveries that the universe is expanding." Okay, so they didn't use the word words "scientific miracle", but on the subject of a book that is claimed to be miraculous it is claimed the information in it is "surprisingly" in line for modern discoveries? 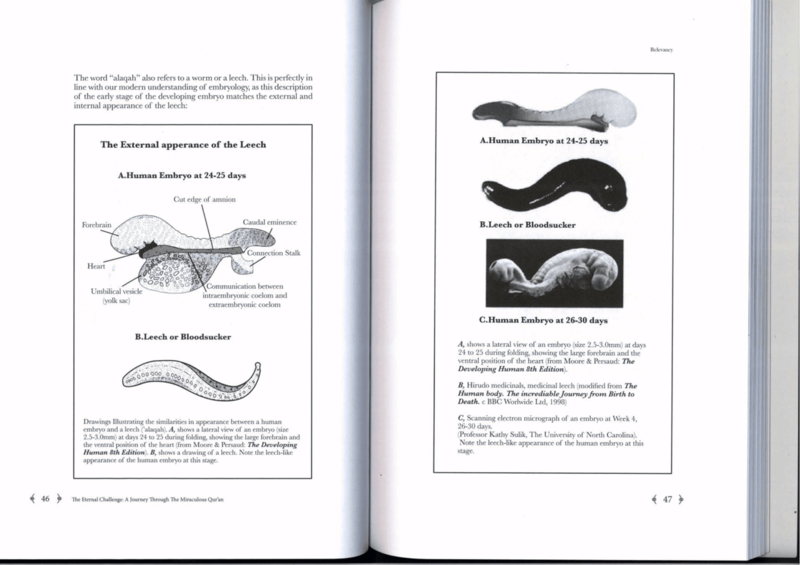 The next page goes on to talk about embryology. Initially I was relieved to see an acknowledgement on this page that Greek and Hebrew physicians used to say the same thing before the Quran was revealed made up. 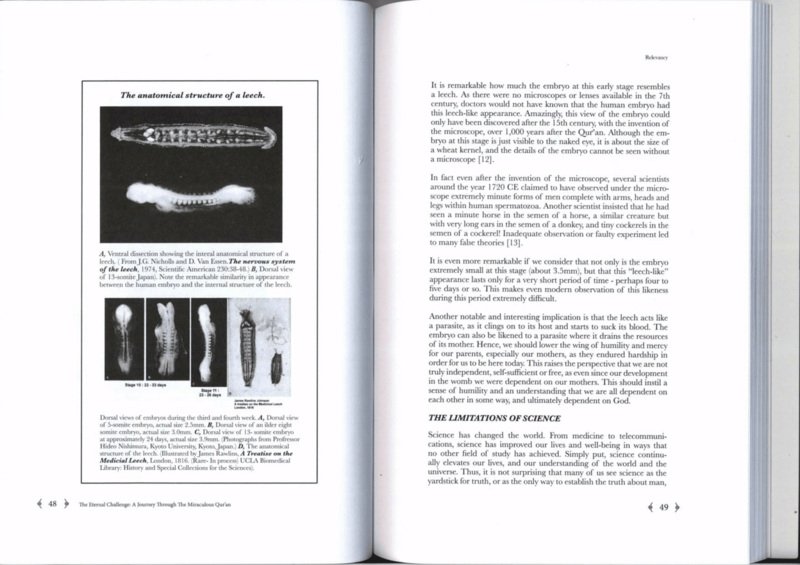 The next pages contain images from "The Developing Human - With Islamic Additions", the book by Keith Moore which acknowledges none other than the billionaire Usama Bin Ladin; presumably Usama provided financial of some kind rather than providing proof-reading services. 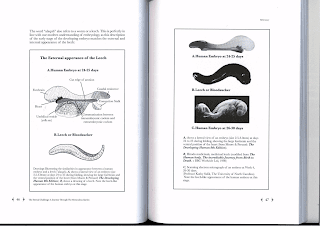 It goes on to claim that doctors of the time would not have known that the embryo at this early stage resembles a leech because this view of the embryo could not have been discovered until after the 15th century, when microscope was invented. Yet again a veiled scientific miracle claim is made without using the words themselves. If this information could not have been known until the 15th century then how could Muhammad have known it in the 7th century? Obviously the Quran doesn't say anything about the embryo looking like a leech. Hundreds of years earlier Galen had already described the leech like properties of embryos. 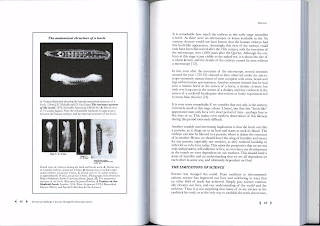 See my video Embryology In The Quran. 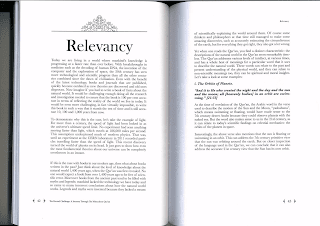 Regrettably, the scientific miracles narrative has become an intellectual embarrassment for Muslim apologists, including myself...It is all a learning curve and an important part of developing intellectual integrity. 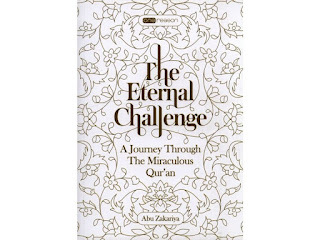 Mr T didn't write this book, but it is being peddled on Dawah stands by iERA. 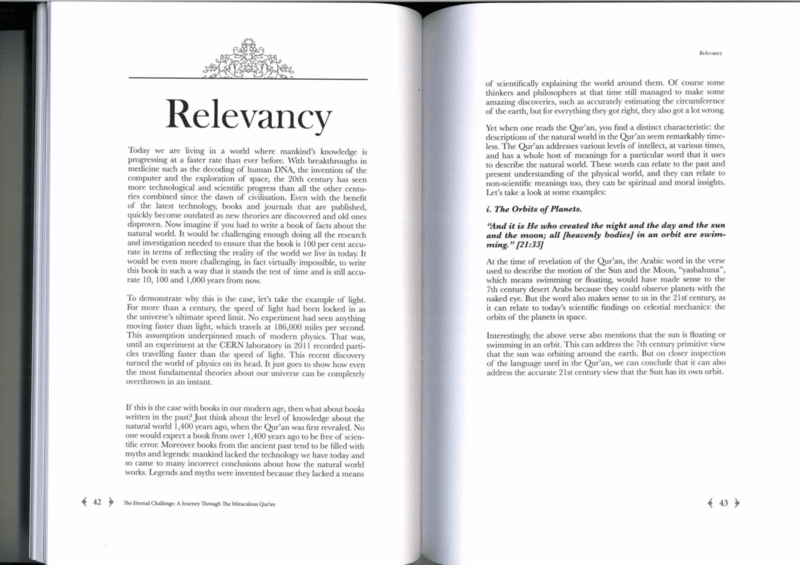 They are passing on to members of the public information they claim they do not believe to be miraculous, in a book about how miraculous the Quran is. How intellectually dishonest is that? 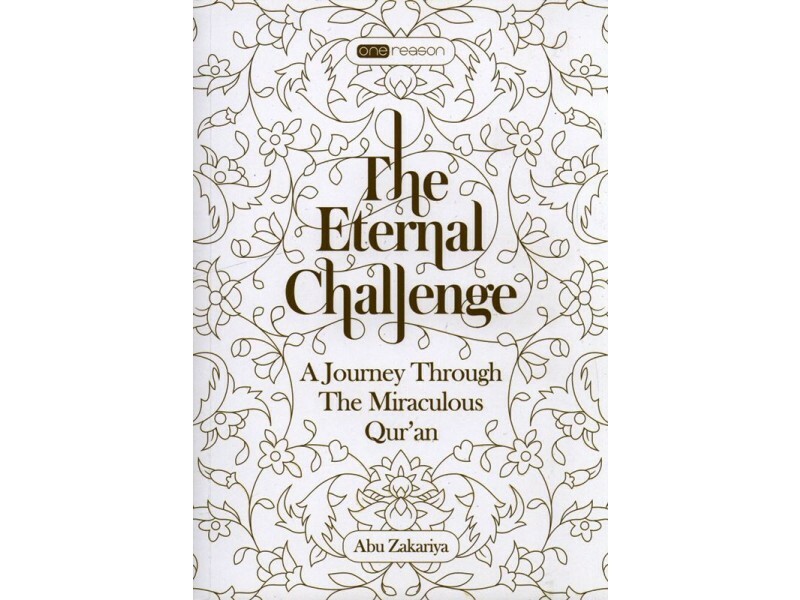 Douglas Adams chose 42 to be "the answer to life, the universe, and everything", and it was page 42 of this book claiming the Quran has all of the answers to life, the universe, and everything that amused me the most. For more than a century, the speed of light had been locked in as the universe's ultimate speed limit. No experiment had seen anything moving faster than light, which travels at 186,000 miles per second. This assumption underpinned much of modern physics. That was, until an experiment at CERN laboratory in 2011 recorded particles travelling faster than the speed of light. This recent discovery turned the world of physics on its head. It just goes to show how even the most fundamental theories about our universe can be completely overthrown in an instant. Does Islam need a reformation? - iERA: Don't hate, debate! I recently attended a discussion in London hosted by iERA. It was entitled "Does Islam need a reformation?" I was pleased that, as I expected, the iERA crew were very friendly with me. Answer: Islam is already great, if we did more of it then everything would be brilliant. PS, look at how bad the non-Islamic world is (a.k.a. "The West"). On the question of modernity and reformation, isn't it more of a case of "Does Islam need to avoid stagnation?" For example, in Surat Al Baqara, chapter 2 verse 282, it talks about how [you should] get a man as a witness but if you can't then use two women so one may remind the other if she errs. Now, in modern times I can't really see how that's an issue because most people in society can read and write; they can recognise their own signature on a piece of paper; there's nothing for them to actually remember!" The four main schools of jurisprudence, and the founders; there's Maliki, Shafi, Hanbali, Hanifi all say that if someone openly admits that they no longer are a Muslim they should be killed. In a modern caliphate would that be an acceptable position, has that position already been reformed, or does Islam need reforming? I'm just going to summarise that before you come back. I think we want to keep it here in the UK. I just want these last few questions to remain about life in the UK rather than in a fantasy caliphate. I didn't ask about a fantasy caliphate. The purpose of my question was to establish whether the punishment is still considered to be valid, if it has already been reformed, or if the panel thinks it should be reformed. Which of these options would a "true Islam" caliphate choose? Yet as soon as I asked a question the principles of the political / legal side of Islam my question was somewhat ridiculed as a fantasy, something that isn't in the real world. Claim the word "Apostasy" is a western invention, and that Islam is actually talking about treason. To prevent slippery escape #1 I used the words "no longer a Muslim", and to prevent slippery escape #2 I used the words "openly admits". The schools of jurisprudence I mentioned all say that someone who outwardly manifests behaviour of transitioning from Muslim to non-Muslim can be killed. When Tom Holland used the word "apostasy" he left the gap in the door of opportunity slightly ajar and enabled Abdullah Al Andalusi to slither his way out of it. But, just to make sure the truth of the situation wasn't accidentally told, Lauren Booth (who probably hasn't heard Andalusi wriggle out of this before) decided to change the question for a second time. He started "The old chestnut of apostasy is always brought up. I've always said the same thing, and I'll say it again". At that point I knew beyond a shadow of a doubt he was going to take the opportunity to dodge my carefully worded question. First he says there is no law under a caliphate or in the UK that creates an inquisition that will check everyone's beliefs and see if they have left Islam or not. That is true. As long as one continues to pray, fast, and never mention to anyone that one's faith in Islam has gone then the Islamic state will leave you alone. However, according to those four main schools of Jurisprudence if one refuses to perform obligatory religious practices such as praying, or if one openly admits they no longer believe, then they to be killed unless they go back to pretending they are still Muslim. It's at this point I shouted out in protest "That's not what I asked!" (1h 20m 30s). I wish iERA hadn't edited the video to show the audience at this point, because my memory of what happened next was Andalusi looking me straight in the eye, sheepishly, as he deceived his way through his answer. I silently mouthed "Shame! Shame!" at him, and shook my head in disappointment. Next he went on to explain how the Arabic word Irtidaad is really about treason, and not about someone who just changes their mind.....in their own head, and that's it. Even in his dodging he has to add his own clause in order to ensure he is being accurate in his answer even if not entirely truthful. Andalusi goes off on a tangent for a while, and even in bringing him back to the subject of the question Lauren Booth once again puts forward a question with the "in the UK" clause that offers him the opportunity to get off the hook while leaving non-Muslims and cultural-Muslims feeling that political Islam is all nice and fluffy and people living within a caliphate are free pass gaily through life not having to worry about what might happen to them if ever they change their mind about being a Muslim. At 1h 22m and 12s I shouted out the request for him to answer my question. Lauren Booth refused, saying I had already asked a question. I shouted out that he is obfuscating, and she replied "I don't think he is, I have asked him twice." - Unfortunately she asked him her own question twice, not mine. There's been a lot of obscurantism on the part of, in particular, Abdullah Al Andalusi when it comes to the matter of apostasy. I've been reading Enemy Of The State by Stephen Yaxley, a.k.a Tommy Robinson. On page 112 he claims that Muslims in Longsight, Manchester were desecrating the graves of Christians after buying St Johns church and converting it into a mosque. Here is a link to a video to the kind of scene that would have greeted the protesters https://www.youtube.com/watch?v=v_yejeSZdwU and is also the video Tommy Robinson directed me to as his evidence - Please watch it in full. The EDL protested against this desecration of graves, but I think Tommy Robinson was misled in order to outrage people against Muslims, and no such grave desecration took place. As this seemingly false claim is documented in his book, and therefore being spread, I am hoping to prove beyond reasonable doubt that this is an error (an honest one I think) and also hoping that Tommy will accept this and ensure the record is set straight in the form of an errata webpage for his book. 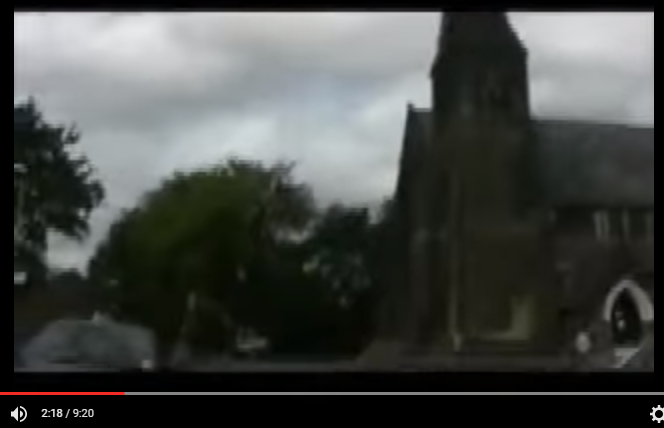 The YouTube video shows a lovely photo of a Christian church complete with gravestones, and then the footage taken at later date shows a flattened ground with a headstone on the floor. The first thing to note is that these are not showing the same side of the building. The picturesque church with graves. The church as seen in the video footage. The scene of the video footage on Google Maps taken in July 2015. One of the great things about Google Street View is that they take photos on more than one occasion. This enables us to look at a scene and then compare it to some point in the past. In this case photos were available for July 2015, and as far back as September 2008. 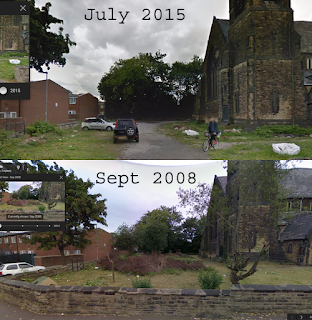 Street View: July 2015 Vs Sept 2008. It is understood the headstones, which have not been identified, were not part of the graveyard - which has not been used since 1966 - but had been moved at some point to form pathways through a church garden, before being covered over. The developers immediately ordered all work to stop. Council planning officers are now investigating. Arshad Nawaz, trustee of the charity that runs the centre, stressed that no grave had been disturbed. He said some £50,000 had been spent to repair the church, which had become dilapidated over the years. The graves and gravestones had been `carefully preserved', he added. "As Muslims we very strongly believe in the sanctity of mankind," he said. Note how the language switches from headstones to gravestones in this article. This is because the preserved part of the land actually had graves on it. These graves were preserved as part of the £50,000 spent restoring this Grade II listed building. Looking through images of the site over the years using Google Earth it would appear that this area of the church has been very overgrown and neglected for a number of years before the building was restored by Muslims and used as a mosque. The bloodless genocide and ethnic cleansing of the British people and culture continues apace with the latest example being the ripping up of a century old Christian cemetery to make way for a mosque in Manchester. 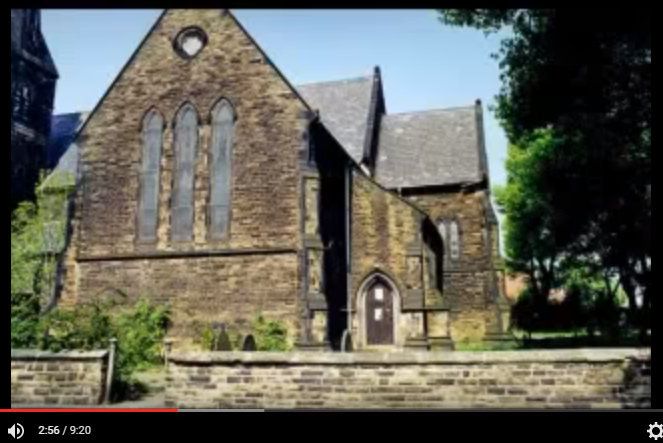 Given the evidence it would seem the BNP used this discovery of a covered up pathway (which had been made out of unused headstones when the church had a garden) and then used it to spread hatred against Muslims by claiming they were tearing down the graves of Christians; the ultimate slap in the face of Christianity from Islam. From there the EDL were stirred up with this misinformation and came to demonstrate against this seemingly sacrilegious act. Soon afterwards local Muslim graves were targeted nearby by vandals. The Manchester Evening Standard article explaining the story of the graveless headstones and the garden path was published within 4 days of the BNP's misinformation exercise but, unfortunately, it was the BNP story that got the attention of the EDL. It seems as though the former EDL leader was duped by Nick Griffin and The BNP, who's agenda was always to seed hatred for anyone not white. 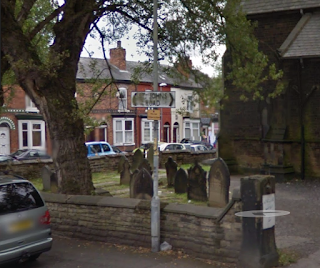 So what did happen to the stones that were on the graves at the side of the church that was being used as a cemetery? They are still there! What these people actually did was spend £50,000 to preserve an abandoned church, and respect the dead.